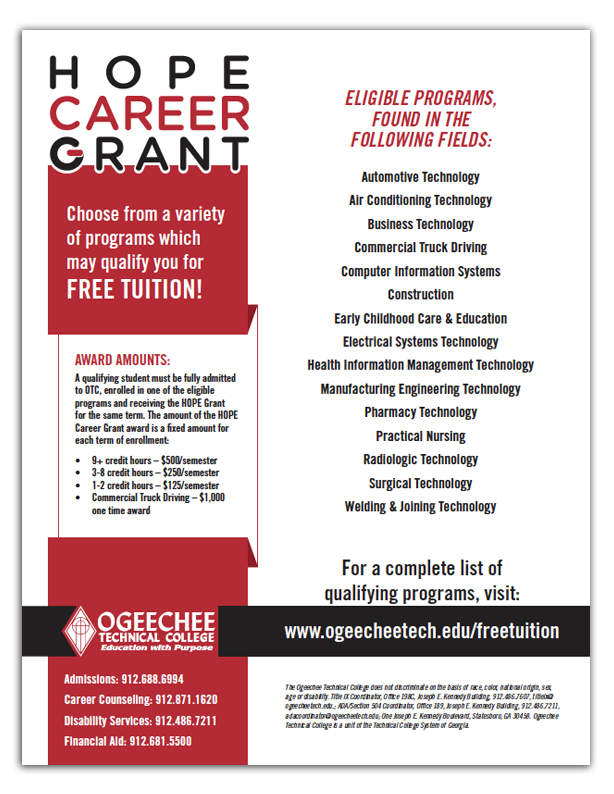 Students interested in entering a field in which there are plenty of job openings can choose to enroll in one of OTC’s programs of study for which this grant covers the cost of tuition. The HOPE Career Grant, formerly known as the Strategic Industries Workforce Development Grant, is the boost a student needs to get started on the right path to an exciting career. It also helps Georgia employers by creating a pipeline of skilled workers they can hire well into the future. To be eligible for the HOPE Career Grant, students must first qualify for and be receiving the HOPE Grant. 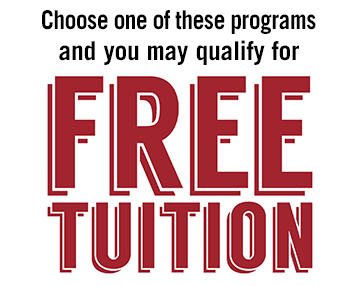 The two grants together will cover all tuition for any of the eligible programs of study. Since it is a grant, it does NOT need to be repaid. HOPE Career Grant awards are based on the student’s program of study and the number of hours of enrollment. The grant is available only for eligible students who are pursuing certificates and diplomas. High school students participating in dual credit enrollment are not eligible for the HOPE Career Grant award until they graduate. All HOPE programs require students to meet basic requirements. Eligibility for the HOPE Career Grant award for the Commercial Truck Driving program is for one term only. The HOPE GED Grant, HOPE Grant, and HOPE Career Grant award can be awarded in the same term, if all other eligibility requirements are met up to cost of attendance. High school students in dual or joint enrollment programs are not eligible for the HOPE Career Grant award. Students who are actively pursuing a GED are eligible for HOPE Career Grant. All eligibility requirements for the HOPE Grant apply to HOPE Career Grant. Submit a $25 nonrefundable application fee. Submit official copies of your high school or GED transcripts. Submit either ACCUPLACER, ASSET, SAT, or ACT test results (5 years old or less), or you can schedule to take the ACCUPLACER with our Assessment Center.